Mountain Dew is back with its hugely successful annual Gaming property, DEW ARENA. This championship has been growing exponentially. From 22,000 participants when it started in 2016 to7,00,000 participants in 2018. Participants from across the country can participate either ON-GROUND through the travelling Dew Arena Gaming Trucks or ONLINE or on MOBILE. 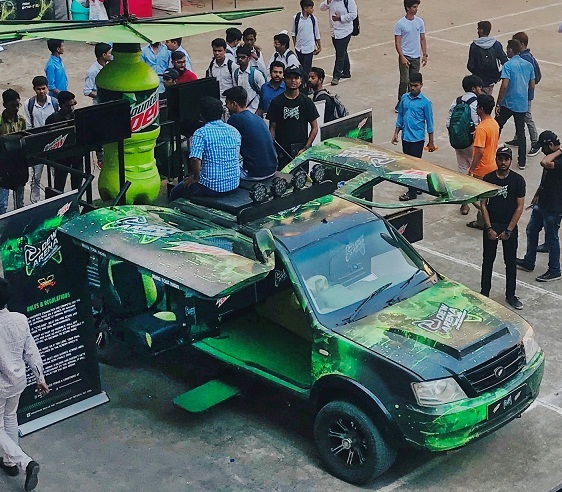 6th – 16th April will see Dew Arena come in to Pune with its disruptive neon GAMING TRUCK; fitted with 16 gaming stations, VR Headsets. The Dew Arena Gaming truck provides one of a kind experiences to gaming enthusiasts across the country. The trucks will be at Kedari Chowk, Wanowrie on 6th, Mundhwa on 7th, Eon IT Park, Kharadi on 8th, MIT College, Hadapsar on 9th, JSPM College, Handewadi on 10th, JSPM College, Wagholi on 11th, Viman Nagar on 13th, Loni Market on 14th, Kharadi on 15th and AM College, Hadaspar on 16th in the city. The ON-GROUND leg of India’s largest Gaming championship will travel across 200 locations across 8 states, including Haryana, Punjab, Uttarakhand, Gujarat, Maharashtra and Karnataka, amongst others in a span of 7 months. DEW ARENA is consistent with the brand’s philosophy of RISK UTHA NAAM BANA by giving a platform for participants to showcase their talent and make a name for themselves. DEW ARENA winners stand a chance to be featured on LIMITED EDITION MOUNTAIN DEW BOTTLES. They will also be able to compete for a prize pool of INR 20 LAKHS through the Championship. While ROCKET LEAGUE and STREET FIGHTER V will be the focus during ON-GROUND leg through DEW ARENA; popular titles such as COUNTER STRIKE and DOTA 2 will take center stage during the online championship.